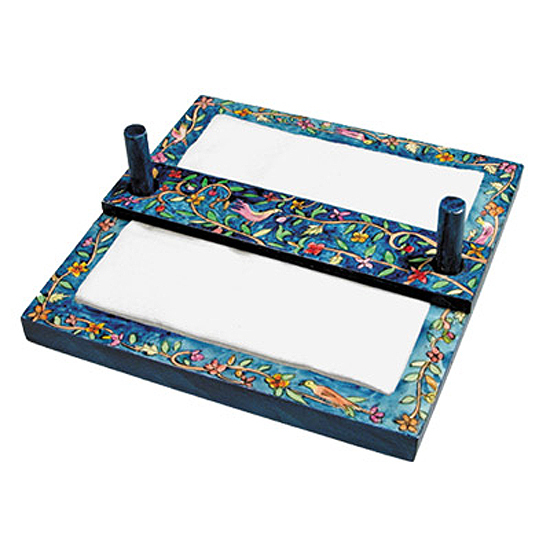 Keep your napkins contained in this brightly painted napkin holder designed Yair Emanuel. 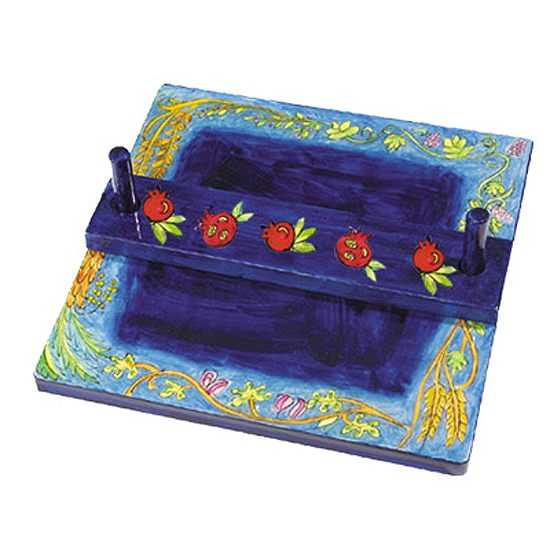 This wooden napkin holder by Judaica designer Yair Emanuel makes a colorful, practical, functional addition to any kitchen or table.+Napkins sit on a square base between two pegs. A single piece of wood, painted to coordinate with the design, slips over the pegs to weight them down and keep them from flying all over – a definite plus if you're dining outdoors! Napkins can be easily slipped out from under the bar.+The hand painted wood has been treated with lacquer to make it easy to clean – just go over it with a damp cloth or sponge. The designer napkin holder adds a bright element to your table setting, and makes a great gift.+Emanuel's napkin holder comes in three designs, all of which feature well-known Jewish motifs rendered in the simple but elegant modern style that characterizes Emanuel's handcrafted tableware.+1-Jerusalem: Buildings and walls of Jerusalem, painted in lively shades of gold, pink, lilac, and orange, run around the edge of the base and across the bar. 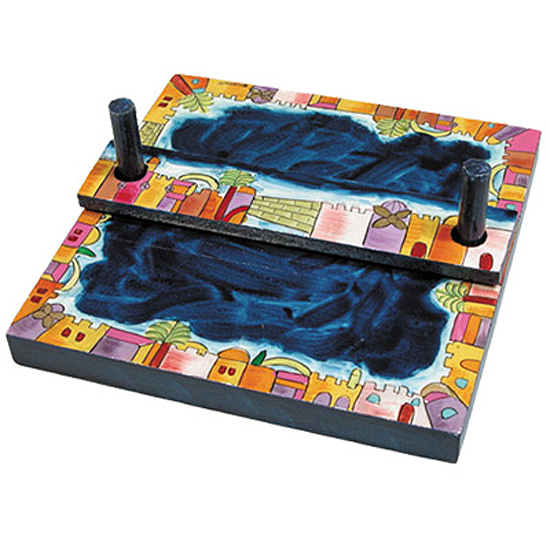 The center and pegs are washed in a rich, dark blue+2-Oriental: A carpet-like design of flowers and birds decorate the border and bar, set against a medium blue background+3-Seven Species: Six of the seven species of the Land of Israel (wheat, barley, grapes, figs, dates, and olives) entwine around the base of this napkin holder, while the seventh –pomegranates - are on the bar. The seven species are painted against a sky-blue background, while the bright red pomegranates are set against a cobalt blue background+Dimensions: 8 x 8 x 2.3' [20.3 x 20.3 x 5.8 cm]+Click to learn more about the Judaica designer Yair Emanuel.